One steamroller of an SUV. The Vosges Mountains can’t hold a proverbial candle to the Pyrenees, let alone the Alps in terms of either scale or majesty. Still, they are a wildly popular destination for those in the know. Even on a workday, the roads scaling the range are thick with motorcycle riders, cyclists, and power walkers. As such, it’s not the optimum location for sampling a vehicle that’s been labelled the fastest and most powerful diesel SUV in the world. In attempting to classify what kind of vehicle the latest Audi is, it’s perhaps most accurate to compare it with a corporate sibling: the Audi SQ7 is, effectively, an off-road ready Audi R8. No, the seven-seater SUV isn’t quite as quick in a straight line as the brand’s resident supercar; nevertheless, the SQ7 can streak from 0–100 kilometres per hour in an estimated 4.8 seconds. Top speed is electronically limited to 250 kilometres per hour, but it’s clear from sampling this high-output behemoth that so much more is possible. Inside the decidedly spacious passenger cabin—seating for seven is possible—the smoke show continues. 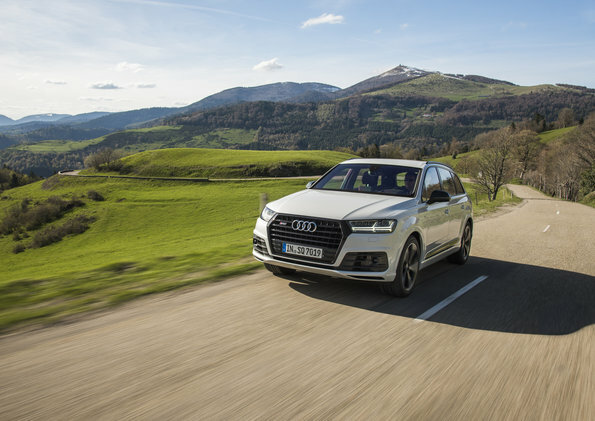 This SQ7 is fitted with Audi’s crisp and configurable TFT instrument panel, the latest version of its intuitive MMI controller, an on-board LTE module with wifi hotspot, a phone box with an inductive charging system, and a pair of tablets for rear-seat passengers. A firmly established tradition for fit, finish, and high-quality materials also continues here. While there was no real opportunity to explore the limits of this intriguing sports SUV due to the popularity of the drive route, the SQ7 TDI still managed to delight during our brief time together. The engine is, as noted, a profound development, particularly given the diesel backlash of late. The driving dynamics of this SUV are another strength. Of course, the SQ7 comes standard with the quattro AWD system; in this application, the system is aided by all-wheel steering, as well as an adjustable electronic roll stabilization system that helps carve corners and perform off-road maneuvers. An optional sport differential includes a torque vectoring capability that makes the cornering just that much crisper. Up and down the hilly terrain, the Audi showed a deftness that defied its size and segment and the on-demand pulling power that makes every drive a distinct pleasure. The SQ7 TDI might not quite be ready for the racetrack, but it’s more than capable of making the average premium sedan look just average.